Four years ago, when I was still working as a children’s author, if you had told me that I would hug nearby hedgelines, crawl through muddy fields, and stand in sad imitation of a tree in order to photograph hares, stoats and short eared owls, I would have laughed. 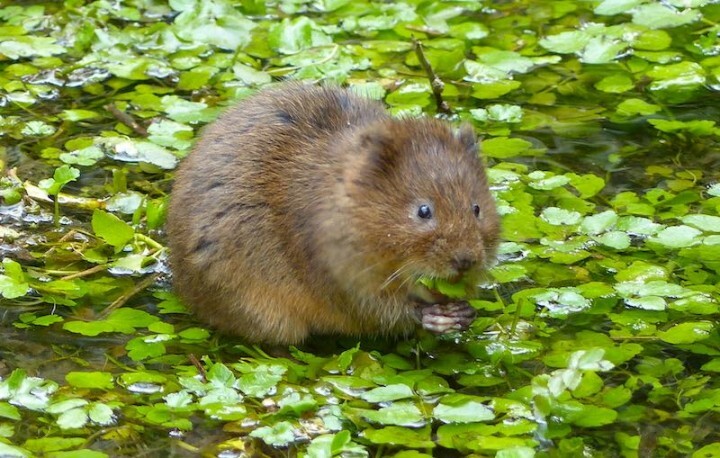 Thanks to my daughter, I was recently made aware of a water vole in a village pond one morning. Being passionate about water voles, I made my way there the same evening in great excitement. It would be my first pond vole, ever! On arrival, I immediately saw the tell-tale signs of a hidden water vole: vegetation periodically twitching as stems of Fool’s watercress were nipped by this invisible gardener. A few moments later, I glimpsed a small juvenile with its rich chestnut coat. Guest post by young wildlife expert Alex White. Sat amongst the bluebells on a late spring evening, a gentle breeze tickling my nose, I am waiting for the first black nose to appear. It is a moment of excitement, tension and a little bit of apprehension.